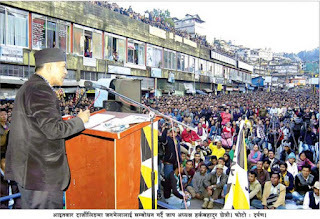 Leaders of the Jan Andolan Party today laced their speeches with rhetoric, taking barbs at the ruling Gorkha Janmukti Morcha, in the party’s first public meeting in Darjeeling sub-division. The JAP also announced a series of political programmes while asserting it would contest all elections in the hills. JAP president Harka Bahadur Chhetri, who quit the GJM last September, was critical of his erstwhile party saying its leaders were not sincere about the Gorkhaland demand and were only exploiting the issue for political gain. “The issue of Gorkhaland is being used by the GJM as a life-saving drug. Neither the GJM nor the BJP, its political ally, is sincere about the statehood demand. To prove us otherwise, we want the GJM to ask its BJP MP to place a private bill on Gorkhaland in Parliament,” he challenged. The JAP may be primarily based in Kalimpong sub-division, but today it made its intentions clear to spread its reach to other areas of the hills. And the public meeting in Darjeeling was to test the waters before plunging into election mode. “Our aspiration is not only to usher in development by cozying up to the state government. We have bigger dreams to achieve. That is why we have applied to the Election Commission seeking to change our party’s nomenclature to All India Jan Andolan Party so that we can give better representation to our community in the country,” said Chhetri. He also announced a slew of political activities to start from November next month. Among them will be to hold a dharna outside the high court in Kolkata to demand an inquiry into nine political murders in the hills including that of Madan Tamang, gherao of Lalkothi to demand state audit on the expenditure of the GTA, sit-ins at the Vidhan Sabha to demand land rights, demand corporation status to Darjeeling municipality and place a Gorkhaland bill in Parliament. “We don’t believe in making bombastic announcements. Our party will announce programmes that will be possible to complete and for people to follow. 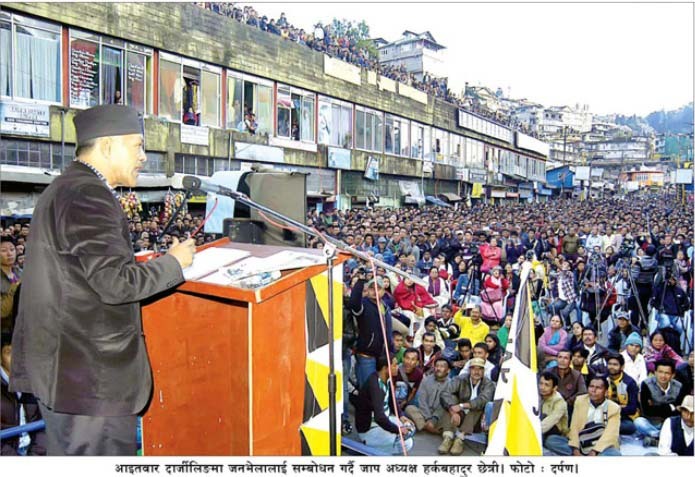 We have seen what other political parties have achieved,” said Chhetri. Other senior JAP leaders spoke on the functioning of the GTA and the sincerity of the BJP towards the statehood issue. “They (GJM) only find faults and say the GTA is not being able to fulfill aspirations. But it has to be taken into account that the GJM has not been able to run the council properly. This is because the GTA is filled with corruption and nepotism. First we must be able to show that we can run small agencies like the GTA, municipality and panchayat, and then make a strong case for the statehood demand,” pointed out Anmol Prasad, senior JAP bureau member and well-known advocate.